Fall's nearly here! Get ready for this fall's biggest trend. Biker babe. Punk chick. For the dudes too. We've seen it before and it's back yet again. And black! is always back. Leather jackets, leather pants, tight jeans, leather padded jackets, fur, over the knees boots, studded anything (shirt, pants, bags, and shoes, and silver. Description: black fitted jackets with pointed, padded shoulders. Long silk harem pants. Tight miniskirts. Leather. Sequins. I didn't like most of this collection though, it's not his usual signiture designs. He went over the board with this hard metal collection. The one I show here are my favorites. I loved the Balmain collection! Its absolutely gorgeous. 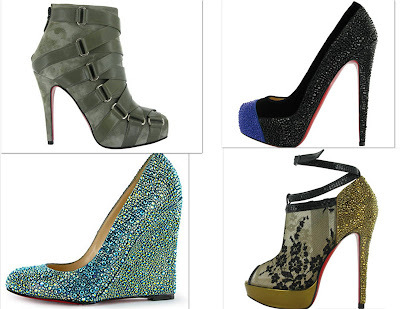 And the Louboutins are ultra glam. Love Love.